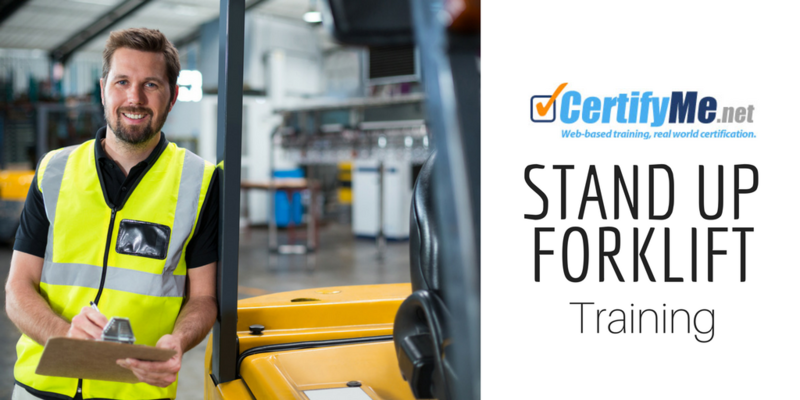 Stand Up Forklift Training – Contact CertifyMe Today! Unlike conventional sit down forklifts, stand up forklifts have the operator standing while operating the lift, reducing operator fatigue and reducing the amount of time they spend getting up and out of the lift to perform duties. From loading and unloading, stacking products, scanning barcodes, dealing with shrink wrap, and more, stand up forklifts have improved the productivity for many warehouses and other workplaces for decades. Learn more about stand up forklifts and why you need stand up forklift training if you want to operate them for your job! What is a Stand Up Forklift Used for? Cargo transport. From warehouses to stockyards, stand up forklifts are one of the most popular types of vehicles for moving, storing and retrieving cargo for shipment. Construction. Interior construction projects typically require a flexible, rapid means of moving material from point A to point B. Stand up forklifts are usually an integral part of inside construction projects, both industrial and residential. Retail. From grocery stores (Sam’s Club) to retailers (Amazon, Target, etc. ), stand up forklifts are important for filling orders, accessing pallets, transporting products and much more. Driver comfort. A standing forklift driver is an alert driver. With plenty of studies showing the perils of sitting for extended periods of time, forklift designers started to implement a standing driver cabin. Space saving design. With a standing driver, a forklift’s overall “footprint” is less than a standard design. This unique configuration allows the forklift to reduce overall width, which makes it ideal for areas where space is at a premium, like store aisles and small warehouses. Stand up forklifts are easy and efficient to use in a number of applications. But they require certain procedures to drive them safely, since they are often used in narrow aisles and closed quarters that are otherwise impossible or risky for conventional forklifts to maneuver. To start a stand up forklift, simply turn the key after checking the forks to ensure they are drawn backwards. When moving without loaded forks, tilt the forks slightly upwards, but not raised up into the air. Use the control handle to control the steering. When you want to move forward, tilt it forward, and tilt it back to move backwards. To pick up a load from up on a rack, use the control handle to lift the forks. Position the forklift in front of the rack of the pallet you need to access. Extend the forks before approaching the pallet, and move in closer to the rack. Once the forklifts are firmly placed inside of the pallet and positioned to hoist it evenly, raise the pallet off the rack slowly and retract the forks. Reverse the forklift always making sure no worker or truck is behind you. Once the coast is clear, drive the forklift and bring the load to the floor. If transporting a load to a different location, elevate the forks about two inches off the ground for clearance. When placing a load onto a rack, reverse the process for picking a load up. What is Stand Up Forklift Certification and Why Do You Need It? Learning how to drive a stand up forklift will take a lot more than just reading a step-by-step instruction. If you want to use stand up forklifts at your job, or for a new job, you need proper stand up forklift training and certification. This specialty course will teach you exactly how to operate a stand up forklift, in all applications like narrow aisles and on ramps, how to perform equipment inspections, how to assess the surrounding environment, and how to avoid hazards to prevent accidents. You’ll come away from the course well equipped to drive stand up forklifts in a professional setting, and have the knowledge to prevent accidents that can lead to damage, injuries, and fatalities. You’ll also be OSHA-compliant to ensure you are up-to-date on all the most important industry and safety regulations. This will not only make you a better, safer worker, but it will make you more valuable to employers. According the Occupational Safety and Health Administration (OSHA), a stand up forklift is classified as a Class I Electric Motor Rider Truck. In this category, stand up forklifts are known as “Lift Code 1” industrial vehicles. OSHA organizes powered industrial vehicles into certain categories, which enables the organization to better manage training programs, safety initiatives and more. Stand up forklifts are just like every other forklift in your fleet, in this regard: any of your employees operating a stand up forklift require the latest stand up forklift certification. CertifyMe offers an affordable, streamlined training session for everybody in your company who operates a stand up forklift. If your employees have to know how to drive a stand up forklift, they’re going to need OSHA-compliant training. CertifyMe, the leader in online training classes, has a stand up forklift certification course that’s perfect for beginners and veteran operators alike. Just like our entire course catalog, our stand up forklift certification training includes a convenient, learn at your own pace format. Plus, you’ll enjoy free 3-year renewals, which OSHA requires for forklift recertification. Complete the training in as little as one hour! To learn more about our stand up forklift certification, or if you’d like to learn how to drive a stand up forklift, please visit our pricing and course page. You can also call our OSHA stand up forklift consultants at 888-699-4800. Thanks for considering CertifyMe for all of your stand up forklift certification requirements.